Renegade is set one year after the aliens came and de-structured the way human society works, humanity has attempted to put the pieces back together. The stated long-term goal of the Marq’ssan was to remake human society into a more cooperative and peaceful society. After disintegrating a number of military assets of the United States government (and likely worldwide, but Duchamp tightly focused Alanya to Alanya on the United States, specifically the Pacific Northwest), and destabilized the government as a whole by destroying communications networks, the Marq’ssan set up a number of Free Zones around the world where humans would be “free” to set up a more cooperative and independent way of life not tied to the extremely hierarchical “Executive” system that was previously in place. Central to the action of Alanya to Alanya was Kay Zeldin, a Seattle history professor and former Executive agent. Zeldin was initially tasked to be the analytical eyes of the United States as a silent “negotiator” with the Marq’ssan. The negotiation did not work out the way the Executive had planned and Zeldin ended up assisting the Marq’ssan and was instrumental in the creation of the Free Zones. In August 2077 the Seattle Free Zone has something of a functioning society working and the beginning of trade with other nations and other Free Zones. The patriarchal Executive government has been replaced in the Free Zone with a more anarchic / communist society which is shaped not by men, but by women. Part of the conceit of these novels is that the male dominated way of authoritative government has failed and has led, if not exactly to the subjugation of women, but certainly to the disrespect of and dismissal of the capabilities of women. The glass ceiling is not only firmly in place, but it has been sealed with concrete. In Alanya to Alanya the negotiators requested by the Marq’ssan were specified only to be women. This, and the fact that the Free Zones were founded / led by women has resulted in a backlash against women by some of the newly disempowered men. The new Cooperatives have had a year of struggle to survive and flourish without the luxuries generally provided by a civil government. The opening chapters of Renegade are prologue to what will be the meat of the novel, but this prologue of 182 pages serves to demonstrate the changes that have occurred in the year following the conclusion of Alanya to Alanya. While the world of Alanya to Alanya was an exaggerated vision of our own, it was also recognizable in many ways. The conclusion of Alanya to Alanya marked a paradigm shift for how that future world of ours would work. Renegade picks up on that, shows the reader the Cooperatives, revisits minor characters from Alanya to Alanya, and also shows the reader what some of the major conflicts are in the Free Zones. Some issues facing the Free Zones are agents from the existing Executive government of the rest of the United States, anger from males who wish power, and the overall struggle to create an entirely new way of life. Growing pains. All of this is prologue to what must be considered the primary story of Renegade: Kay Zeldin versus Elizabeth Weatherall. In the year following Alanya to Alanya’s conclusion, Kay Zeldin has been hunted by agents of the Executive. Elizabeth Weatherall, the personal assistant to Robert Sedgewick (the head of the Security branch of the Executive), is leading the hunt to capture Zeldin. All Zeldin knows is that if she isn’t careful she will be taken, interrogated, and killed. Despite this threat for her life, Zeldin searches for her husband, one of many scientists who disappeared under the guise of working on a “secret project” for the Executive. This search, however, will expose Zeldin to Weatherall’s team hunting her. The back cover of Renegade claims that Zeldin and Weatherall will “risk all she has become in no-holds-barred, mortal combat”. This is extremely misleading as it suggests something along the lines of a cage-fight, or less crassly, a physical contest between the champions of two armies where the outcome will decide the war. Renegade is not that kind of novel. The meat of Renegade is an intellectual battle of wills between Kay Zeldin and Elizabeth Weatherall. It is no spoiler to disclose that Zeldin is eventually captured by the Security forces and the battle is not a knock-down drag-out physical confrontation. It is a conflict of captivity, of interrogation, of Stockholm Syndrome, of so dominating the will of the other that her will is co-opted. There are two things at play in this battle of wills. First, the reader never gets the story through the eyes of Elizabeth Weatherall. Instead, Duchamp’s choice of perspective is Weatherall’s personal assistant Allison. Allison is a young Executive woman and is somewhat politically naïve. This permits Duchamp to give huge info-dumps on the motivations of Elizabeth Weatherall in the form of a Socratic dialogue between Weatherall and Allison. Allison asks a question, admits that she does not understand, and Weatherall spends paragraphs (and pages) explaining the reasoning, often in dismissive language, for Weatherall’s actions. Allison plays the role of the student, saying one or two things to lead Weatherall to continue the monologue (which is essentially what a Socratic dialogue is), and otherwise keep quiet. Allison found Elizabeth's use of so many abstractions confusing. "I don't understand what you mean when you talk about these structures and reality and so on." The thing that sets Renegade apart from Alanya to Alanya has little do with the Marq’ssan, the human / alien conflict, or even the attempts to build a new human society outside the bounds of what is generally known as “civilization”. What sets Renegade apart and distinct from Alanya to Alanya is just how intellectual and self-aware the characters are of their motivations and actions. There is a great deal of self-analysis from Kay Zeldin and Elizabeth Weatherall in exactly what their actions means intellectually and morally and Duchamp allows her characters to clearly define the larger meaning of everything they say and do. "You apologize. For what exactly do you apologize, Kay?" Kay swallowed. Weatherall was going to make it as hard as she could. "I apologize for using ideological and inflammatory words, and for being rude to you." "Let me see. What was it you said during my last visit about moral authority . . . Does this mean you grant me the moral authority to punish you?" On one hand this is a fascinating exercise that defines in literal terms what everything in the novel means. There is always a question of whether the characters are telling the truth when explaining their actions, or if they are capable of accurately evaluating their own motivations. This is most important to consider in the character of Elizabeth Weatherall, because unlike Kay Zeldin, we only see Weatherall through the eyes of her personal assistant and lover, Allison. The reader is given detailed intellectual explanation from the mouth of Elizabeth Weatherall, but the reader is never in Weatherall’s head. So, as far as it goes, Renegade is an intellectual battle taking the form of captivity and privation. The flip side is that most of Renegade is a huge instance of tell and not show. Because the characters so frequently pontificate the reasons behind their actions, the reader is being force-fed the story rather than experiencing the novel and coming up with his or her own interpretation. This can be a major turn-off for many readers. 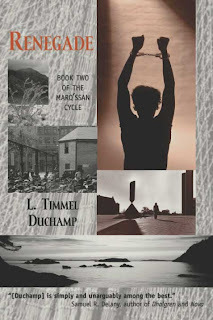 L. Timmel Duchamp did such a good job in Alanya to Alanya in creating this situation that so hooked the reader that even through chapters of info-dump and pages of detailed explanations of motivations, the readers are so engaged with the characters that Renegade never feels flat. By all rights it should feel flat, but it never does. Duchamp ratchets up the tension chapter by chapter because the reader has no real expectation or pre-understanding of how this story should resolve itself. The ending, as far as the reader is concerned, is not set and Duchamp is willing to do Very Bad Things to her characters and protagonists. Renegade is a very different novel from Alanya to Alanya. It is much more introspective and self-evaluating. There are hundreds of pages with Zeldin in captivity and because of this, Renegade has a feeling of stagnation, that things may never change. This comes through the perspective of Kay Zeldin, of course, but the reader experiences it for an extended period of time and over the course of a large number of pages. Very likely, whatever aims L. Timmel Duchamp had in writing Renegade were met. She is a good enough writer to be able to accomplish what she sets out to do, and the extended captivity sequences were integral to the novel. Through these sequences and through the eyes of Allison, the reader learns so much more about what Elizabeth Weatherall is willing to do (though never why she is willing to do them). It is these same sequences, however, that may discourage some readers. As a whole, Renegade is not a completely satisfying novel. It comes on the heels of a much more straightforward Alanya to Alanya and there is still the knowledge that there are three more volumes in the Marq’ssan Cycle to come. How Renegade is viewed will likely depend entirely on the final three novels. The story it tells, on deeper reflection, is a fascinating one. If the comparison is even remotely appropriate, it has echoes of Primo Levi’s Survival in Auschwitz. For Kay Zeldin, it is certainly that kind of personal story (as it was for Levi), though certainly on a larger scale there is no comparison as the captivity is centralized on Kay Zeldin and not put into a larger context of what Survival in Auschwitz really was about (one man’s experience to help explain a much larger and incomprehensible genocide – the Shoah). On a smaller scale, though, Kay Zeldin’s captivity and her emotional responses and breakdowns are relatable. Renegade does require that deeper reflection. The superficial reading will likely leave the reader feeling cold and unsatisfied after some of the vibrancy of Alanya to Alanya. The choice of the word “superficial” is not meant to denigrate a particular reading style or the capabilities of understanding of various readers, but rather to show that Renegade only benefits from distance and thought. In writing this review my final opinion changed from an unenthusiastic shrug to a more grudging appreciation for what story L. Timmel Duchamp told. Renegade does come across as cold and intellectual (read: unemotional) at times, but as part of the larger series I believe that Renegade will ultimately be a successful novel, though perhaps not a favorite novel.